This week on Quick Fire Community Questions, we interviewed Ubisoft Star Player and Assassin's Creed UK Admin Dave Woodward. ​Hello Dave, welcome to the first interview of our new series Quick Fire Community Questions. This is a new series where we will be interviewing different members of the Assassin’s Creed community to get their thoughts surrounding the content of the Assassins Creed games, as well as details and experiences from their journey within the franchise. Ashlea: How did you first become involved in the AC franchise? What was the first game you played? Dave: Hi Ashlea , I first got into the AC franchise by playing AC1 which I really enjoyed and that was the first AC game I played too but it wasn’t the game that got me hooked into the franchise. Ashlea: What about AC made you love the games? What made you a fan in the first place? Dave: What made me love the games was the characters development throughout the series also i loved that we got to experience their journey during their time with the Assassin’s. AC 2 was the game that got me hooked and a big fan. I loved the scenery and especially Ezio Auditore's but if I’m honest I was drawn into AC2 when I first saw the E3 trailer for the game. I would constantly spend hours watching it over and over. Ashlea: Which AC game is your favourite and why? Dave: My favourite AC game would have to be AC Black Flag I loved sailing the seas and singing along to the sea shanties, plundering ships, exploring the Caribbean and also being a pirate! I love Edward's story from wanting to become a privateer to becoming rich and when that doesn’t work out he finds a greater course with the Assassin’s when basically he’s lost those that were close to him, plus I’m a big Matt Ryan fan and he did a fantastic job as Edward. I can’t watch anything he’s in now without thinking of Edward Kenway. Ashlea: When did you become a collector of AC merchandise? What if your favourite item(s) in your collection? ​Dave: I first became a collector back when AC Brotherhood was released, that was my first special edition I bought and shortly after that I started my collection. My favourite items are my Edward Kenway Pop Vinyl, Edward Kenway on the Jackdaw, Bayek & Aya and Conner assassinating a templar with his Tomahawk figurine. Ashlea: When did you get your first AC tattoo? What AC tattoos do you have? ​Dave: I got my first AC tattoo back in 2011 and that was of a female assassin from a Ubiworkshop artwork which you received in the AC Brotherhood Special Edition if I’m correct. Well I have that female assassin I mentioned, and I also have another Ubiworkshop art of another female assassin. Miss Evie Frye, Harlequin on my hand from ACB, Edward Kenway, Ezio and Caesar Borgia, ACO logo, Apple of Eden, Abstergo Logo, Templar Cross, Connors Tomahawk. I still have enough space to add 1 or two more. Ashlea: What is your favourite part of being a member of the AC community? Dave: My favourite part about being in the AC community is all the people I have met in person or via social media. I think our community is one of the best out there and it just keeps on getting stronger. Ashlea: What is your best memory of being an AC community member? Ashlea: How was Assassin’s Creed UK created? What gave you the idea? Dave: Assassin’s Creed UK was created when one day I thought there isn’t anything out there in the UK unlike in other countries such as AC Egypt & AC Colombia, and I wanted to have a hobby outside of work . Ashlea: What happened at the Wales ComicCon meetup? What are your thoughts and feelings about your experiences at the event? 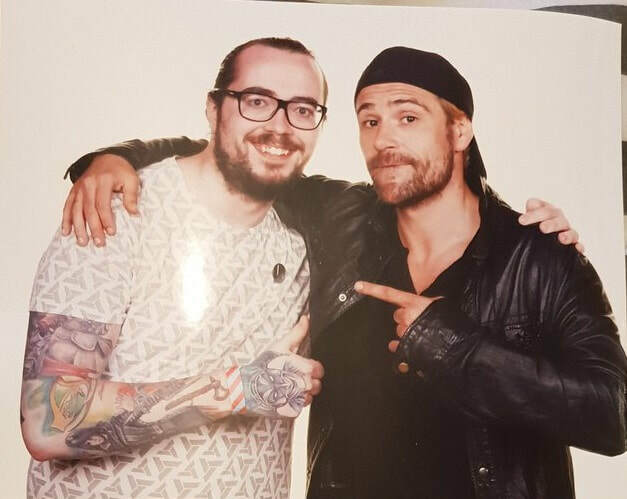 Dave: We were very lucky to have Matt Ryan (Edward Kenway) happily take part in a photo op with a few community members that were at the event. I’m looking forward to meeting more community members at future events. MCM Comic Con in London’s AC meet up was fantastic so I’m hoping we at Assasssins Creed United Kingdom can do something like that. My thoughts on the event were that it was a pretty decent event, but getting in could of been a lot easier and also the use of having more signs available but hopefully that gets sorted for the event in December. Ashlea: How does it feel to be chosen as a Star Player? What was your reaction when you were first contacted about the role? ​Dave: It feels absolutely fantastic to be chosen as a Star Player, as it’s been a dream of mine for a couple of years now and to have been thought of by the people at Ubisoft (Alan, Dom, Uliwia) is fantastic. I owe them a lot for this once in a life time opportunity. I was in work when I found out and the smile on my face wouldn’t go away. I was forgetting people’s orders due to me constantly thinking about being a Star Player. Ashlea: What will your role entail? How/why are people selected as a Star Player? ​Dave: I guess my role will be representing Ubisoft first and foremost on the show floor interacting with fellow star players, staff and video gamers, and maybe getting my hands on a cheeky play of Odyssey ;-) I believe people are selected to become Star Players for being such passionate fans, whether it’s through cosplaying, collecting, artwork, streaming gameplay and making themselves noticeable to Ubisoft. Ashlea: What are you looking forward to most at E3? What are your Predictions for the event? Dave: Well my predictions would of been for a new AC game but Ubisoft have announced AC Odyssey now which I’m super excited for, and I’m looking forward to finding out more about The Division 2 and many other titles. Ashlea: What are your plans for future involvement in the AC community? Will there be more events with meetups? Do you plan to add any more AC tattoos? Dave: My plans at the moment are to keep on doing what I’m doing and being active through Twitter, Instagram and Facebook, hoping to maybe add competitions somewhere down the line for some lucky community members. Yes I’m hoping there will be plenty of AC meet ups at the two events. I know I’ll be at EGX in September and also Wales Comic Con Part 2 in December so hopefully any AC fans going to either of them can come and say hi and we can all have a photo together and have a fun time. Oh god yes I still have a few little spaces left on my AC arm to fill in atm I’m thinking about getting the Ubisoft logo and the star player logo on my arm somewhere or maybe my wrist. ​Thank you for taking part in our interview, we look forward to hearing about your adventures and experiences from your time at E3, have fun!